Since its official beginnings in 2007, social media has played an important role in the management of and education about cultural heritage on campus. Social media is part of a larger multifaceted communication plan that has been developed as part of this program for multiple reasons, and is not simply a tool for public engagement. Over the last seven years, we’ve changed, updated, and maintained a social media presence that has been pivotal in our success as a small group in a large university. At the Midwest Historical Archaeology Conference on September 28, 2014- I had the opportunity to present on why our social media presence has been successful and how we have used it. Here, I want to share some of the ways we’ve creatively used social media, and the things that we’ve learned over the last seven years. We share updates about fieldwork, we invite people to come watch our excavations, and we share information about what we’ve found and how we’ve interpreted it. This provides the public with knowledge that their shared Spartan heritage is being protected, gives them new information about this heritage, and it reveals the process of archaeology, improving the transparency of the work that we do and making it more accessible. Our work isn’t just for the local community- it is part of the larger public archaeology being conducted around the world! 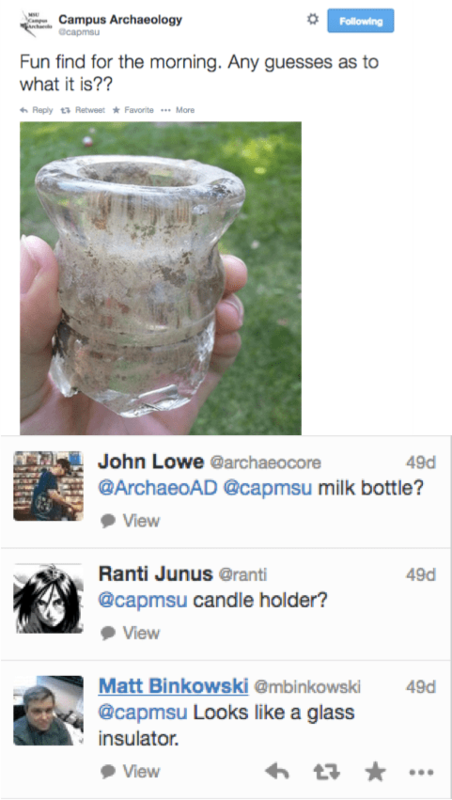 We use social media to talk with other archaeologists about the work they are doing, and we also use this network to get help identifying artifacts, finding resources to aid in interpretation, and learning about new tools we can use. As our world is increasingly online, it is important for our students to learn about digital tools and how to use them as an archaeologist. We provide an opportunity for our students to learn how to use social media and talk with diverse audiences. By keeping digital records of the work we are doing, we can access photos, data, reports, and more from the different social media tools we use. Flickr maintains a photo record, YouTube has a video record, our blog has information about past interpretations, and Storify has records of the Twitter feeds from different events. After seven years of using social media in this fashion, we’ve learned a number of lessons that will be helpful for those looking to improve their own program’s social media presence. Use a wide variety of social media and digital tools: there isn’t one perfect tool that will allow you to reach everyone and engage with all the different groups. There are different audiences using different tools, which means that you need to find a range of tools that works for you. Often, we post similar things on Twitter and Facebook, because there are different groups reading them. Be flexible and try new things: new types of tools and software are being released almost every day, so you cannot be wedded to one type of approach or a set of tools. We are constantly on the lookout for new ways to engage and collaborate online. Its important to look for what new ways people are using to communicate with one another, and be willing to take up new tools and abandon the old if it no longer serves its purpose. Keep track of analytics: analytics tell you how many hits you are getting, how many people are looking at the site, what posts or tweets are the most engaged with, and more. From this, you can better adjust and maintain the success of your social media. Almost all social media have analytics tools that will help you see what is getting the most attention, and what needs to be changed. If you’d like to learn more, Dr. Goldstein will be leading a webinar about this topic!